This software simulates a marine VHF radio with integrated Digital Selective Calling (DSC) controller according to the latest ITU Radio Regulations and Recommendations relevant to small craft and leisure boats. 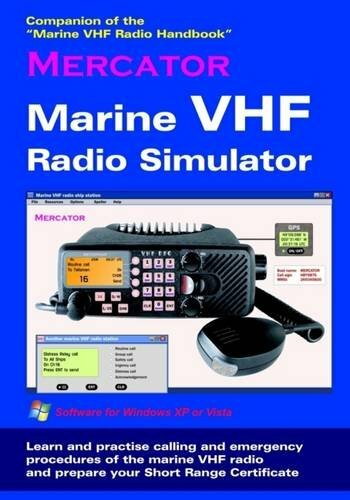 The simulator implements the operational procedures and protocols of the marine VHF radio with Class D equipment, according to Recommendation ITU-R M.493. With this simulated VHF radio you can transmit and receive routine calls as well as distress alerts and safety and urgency announcements and another VHF radio (a nearby ship station or a remote coast station) can send an acknowledgement or incoming calls. The user can therefore see both sides of the transmission. Using the microphone of your PC, your voice messages are transmitted to other stations and could be replayed to check whether they are correct. To practise communications in standard maritime English, you receive recorded "Mayday", "Pan Pan" and "Securite" calls from other ships and coast stations in the navigational area. This simulator allows unlimited practice in generating and handling every type of VHF calls, with no risk of false alerts. Software for Windows XP, Vista and Windows 7. Laszlo Mercz is founder and director of Mercator Publishing, a source of marine radio communications information. He was for 20 years senior advisor of the International Telecommunication Union (ITU), now member of the ITU Working Party 5B on maritime mobile service including GMDSS. He is a keen sailor, in charge of offshore navigation training for the Cruising Club of Switzerland and an instructor of radio operator training courses.